Eric Lui 1P swept the annual Congress Tune-up tournament 4-0 Saturday at the National Go Center. Eric’s undefeated streak in NGC tournaments now extends for over a year, and the local crowd is rooting for him in the prestigious Open Masters next month at the US Go Congress in Williamsburg VA. Justin Teng (6D) and Qingbo Zhang (5d) tied for second in the high Dan division. Darren Bias (1K) went undefeated at 4-0 to win the 1K-3D division. 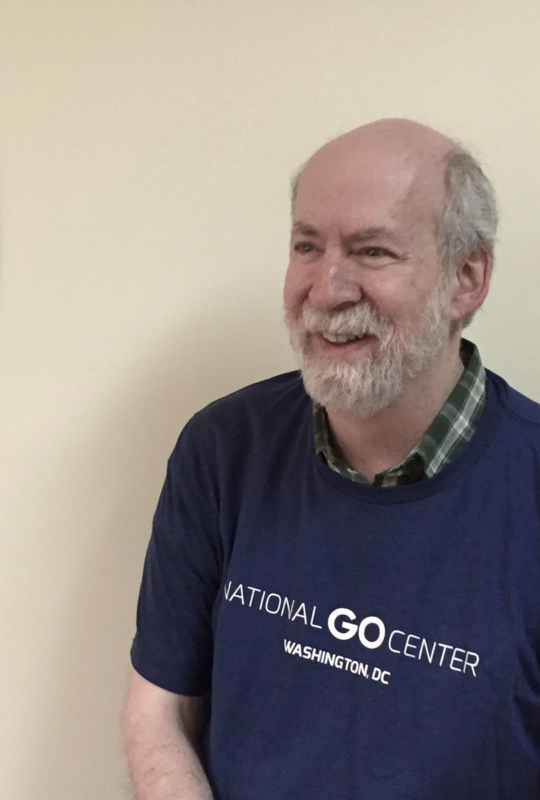 Haskell (Hal) Small (2D) finished second but was only awarded his NGC t-shirt prize if the self-described “non t-shirt person” agreed to pose in it for a picture (right); Congress organizers wanted to be sure it got worn at least once. “If you see Hal at Congress this year, encourage him to wear his shirt proudly,” said TD Gurujeet Khalsa. There was a three way tie for first in the 4K-9K division with Mike Lash (4K), Eli Ferster (6K), and Tevis Tsai (6K) taking home the honors. In the 10K-20K division, John Christensen (13K) made a strong undefeated showing, while second place was tied between Jack de la Beaujardiere (10K), Noah Mullinax (11K), and Joshua Johnson (14K). Congress is less than a month away, so if you haven’t registered yet, you can still do so here. Also download the free Congress mobile app where you can see the bios of Eric Lui and other pros coming this year, and lots more.